For those of you who read Cheat Codes – Peeling Pearl Onions, you know that we at CPM love tiny onions. But sometimes tiny onions are a little bigger than others. But not really big enough to be “big” onions. I often wondered – what if I made these almost tiny onions into tiny onion rings and used them as garnish on things like soup or salad. You know – like bite-sized onion rings you could just pop in your mouth. The result was everything I wanted it to be. I’m lucky to have even taken pictures of these few rings before they were gobbled up. I’m using Amelia’s Homemade Onion Ring Recipe, which I copy below. Super good recipe! Most of the photos are of the tiny onion rings, except for the frying part, which I didn’t have time to photograph. 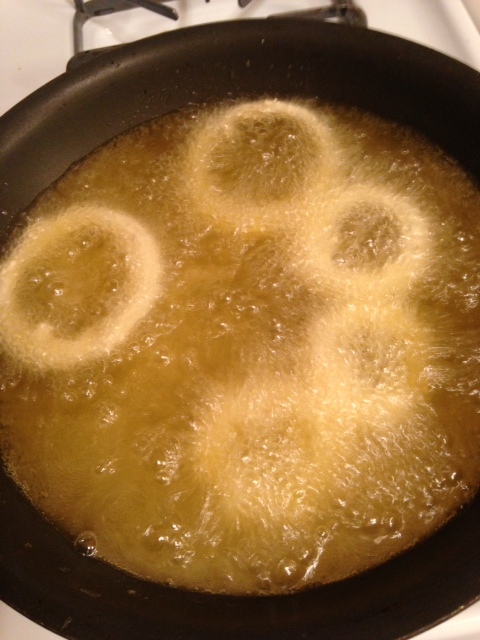 Fry a few rings at a time, careful not to crowd the pan. Cook around 30 seconds per side, flipping once, until golden brown. They were so good, I even had to make some Butternut Squash Soup to go with the garnish. Tags: amelias onion rings, appetizers, food, fried onion rings, garnish, mini onion rings, onion rings soaked in buttermilk, what to do with pearl onions, with images. Bookmark the permalink. Oh my goodness! Those look amazingly delicious!! So good that I need to scroll down before I start drooling!